Wake up America: Barack Obama Takes Online Donation From Adolfe Hitler- Then Thanks Him!! Barack Obama Takes Online Donation From Adolfe Hitler- Then Thanks Him!! Not the real Adolfe Hitler, probably not even a person using a real name, but representative of the type of problems being seen and finally reported by the mainstream news outlets about Barack Obama online donors. Let us start with the Hitler donation and move on from there to the Washington Post article today showing how the Obama campaign deliberately did not implement security measures which allow Adolfe Hitler and others to get away with donating money using things like pre-paid credit cards and avoiding the limits set to what a campaign can accept. Thanks for joining this movement. It will take all of us working together to bring change to this country, and we wanted to make sure you know about all the opportunities to get involved in your community and online. The WAPO piece shows exactly how some of these donations come to be accepted by the Obama campaign in a piece they titled "Obama Accepting Untraceable Donations." There is your teaser from the top paragraph, go read the rest to see how huge this problem is. The bottom line here is that all campaigns end up having to return monies donated after reviewing the donations but Obama's campaign relied on over two-thirds of their donations coming from the Internet. There is your bottom line... sure all campaigns end up having to return monies that make it past their security measures, and yes John McCain has also had to return monies deemed unacceptable from donors deemed unacceptable, but Obama and his campaign have deliberately chosen to not implement the basic security measures that would catch a large portion of dummy donations. Public financing a general election campaign was put into place and candidates for decades have been using it in the name of fairness, yet this election cycle, despite pledging to use the system, Barack Obama went back on that pledge and opted out of it because of his ability to collect online donations and the fact that he believed it would give him an advantage and he could attempt to "buy" the election by outspending the $84+ million that John McCain received by keeping his pledge to use public financing. Obama opened the door to this type of fraud, then took all the security measures away that would stop Adolfe from donating without proper checks to make sure Adolfe existed, to stop someone from using Mary's name from donating $172,500 more than the contribution limits allowed and allowed people from other countries to donate illegally. Crazy Eight from Swindler Lane just made a $25 dollar donation to Obama for America. It went right through to my credit card after a two day delay. No security code. No address check. No name verification. Nothing. Unbelievable. At PBTS, John Ronning reports "How foreign liberals (and jihadis for the matter) can contribute illegally to the Obama campaign." They can do it the same way Crazy Eight and so many others have done. 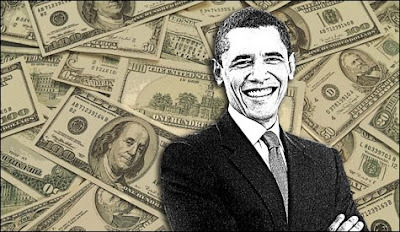 "Fully $100 million of the record-breaking $150 million that the Obama campaign collected in September alone came over the internet via credit card donations." Obama's campaign laws say they have scrubbed contributions that appear dubious. One lawyer, Robert Bauer, attacked the premise, saying, "I have not seen the McCain compliance staff ascending to heaven on a cloud." Campaign aides justified their practice of vetting donations once they'd been received, saying that matching credit cards with people's name is not a standard check conducted or made available in the credit card processing industry. That claim appears untrue. A senior technology adviser for Sen. John Kerry's 2004 presidential campaign said it is possible to require donor's names and addresses match. Any grocery store clerk can tell you that credit cards transactions are rejected all the time if an address, name or zip code does not match, so one would expect a lawyer working for a presidential candidate to be aware of the fact that those type of security measures do exist.